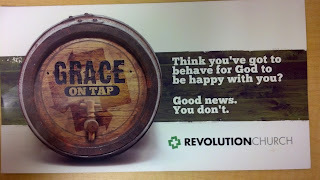 My favorite "Church is Entertainment" nondenominational sect sent out another postcard this week. God is on tap! The postcard declares. I guess that now they are trying to gather the alcoholics into the flock, maybe? Then there is the comment, "Think you have to be good?" This particular statement is concerning to me--are they saying that I don't have to behave myself at all? I can run amok and inflict damage upon the populace and God will be happy? I don't think they are reading the same bible that I am. On the back of the postcard, there's discussion about how there's a tap that never runs dry, and the tab is already paid in full. But you have to attend the sermon to find out how, of course. And I am sure that the collection plate will be passed around at least twice, because mass mailings of postcards are expensive. Zane's first soccer game is this weekend. Zane picked out the team colors for this season, and being a confident almost six-year-old, he chose uniforms which are bright yellow. As a soccer mom, my first thought was "Oh no! There's no way I'll be able to get the dirt stains out of that!" Then I had to laugh. When I was young and contemplating life as a mom, laundry certainly never entered my daydreams! My daydreams about motherhood mostly involved hearing my son's name on the intercom at various events. There was never anything messy or weird, which really covers most aspects of parenting. If daydreams were about realistic aspects of being a parent, nobody would ever be coaxed into the vocation. I got an email from the human resources department at my new job--you know, the ones who left me questioning whether I would be receiving a paycheck in August? Those guys. My Monday email was certainly not a pleasant surprise. It informed me that, oh gosh darn, they were completely unaware that I had received a paycheck last month. Apparently those payroll people are just handing out paychecks all higgedly-piggedly, without telling the people who submitted the payment information to payroll in the first place. As a consequence, they forgot to take any of my benefits out. I read the email further, a sinking in the middle of my stomach. The people who make these sorts of mistakes are never the ones who actually have to pay for those mistakes. No, the email informed me that I myself now had two options: either immediately hand over a check for 900$ to cover those benefits, or they would be taking 1800$ out of my September paycheck. Ouch. I had to read the email twice, certain that another mistake had been made. To say that I was angry would be an understatement, but I had to get over that. Anger in this situation would not change the outcome--we'd still be out money. So I calmed myself down and went down to human resources, where they at least had the grace to apologize. It didn't make me feel any better. Since it was their mistake, they should have paid for it. But that's not the way the world works, and I'm old enough to understand that. I have mentioned before that my husband is a mosquito magnet. He gets grouchy at me that I'm often untouched by those insects, which is totally unfair. I may not have to worry about mosquitoes and their diseases, but I do seem to attract fire ants. For those who have the good fortune to live up in the northern sections of our great country, fire ants are evil little beings whose sole purpose in life is to bite my ankles repeatedly. Their bites feel as though you were holding a lighter next to your skin. The gifts just keep on coming--within a day, the area has a bite mark that looks a bit like a pimple. If you scratch that bite, you are treated to more pain, as the area is suddenly inflamed once more. My ankles look as though they are going through a second puberty! I've done what I can to avoid mounds, but the fire ants have evolved. Many of them don't bother with mounds anymore, and I'll find myself standing in the middle of them without knowing how I got there. The worst thing about the bites is that my body is starting to have an allergic reaction to the venom; I would rather not have to carry around an epi-pen! That's one more thing that will get lost in the bottom of my purse. Go visit Stacy--I am sure that she will be around at some point this week. 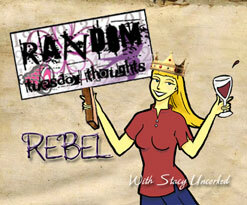 I am being all random on Monday instead of Tuesday, just because! Go do something random to make up for Mondays, and make sure that it involves chocolate!